One of the friendliest characters at Zanin was Marco, the forklift driver, who would load your order onto your truck. He was a ringer for Uncle Fester of the Munsters. One day, a couple of years before Zanin closed down, Marco reached down from his forklift (which he called a high/low) and offered me a business card. He said, “Why doncha visit my friend Stanley?” The card said, “Allied Terrazzo Co. Precast Treads Risers Stringers Cove Base Sills & Saddles.” The address was 129th Street in College Point, Queens. I called and arranged to visit Stanley at his workshop in an industrial part of Queens. He told me that I could bring some terrazzo to grind if I liked. Stanley was a big strapping fellow of Polish descent, Stan Mazeka. He was a really nice guy, quite friendly, and in his mid-sixties when I met him. He commented jovially that we had a lot in common as non-Italians in the terrazzo trade. He told me that he had made 90% of the precast terrazzo stair treads for public schools in Long Island. Now, Stanley was just trying to pay the rent on his workshop by renting time there to people like me. 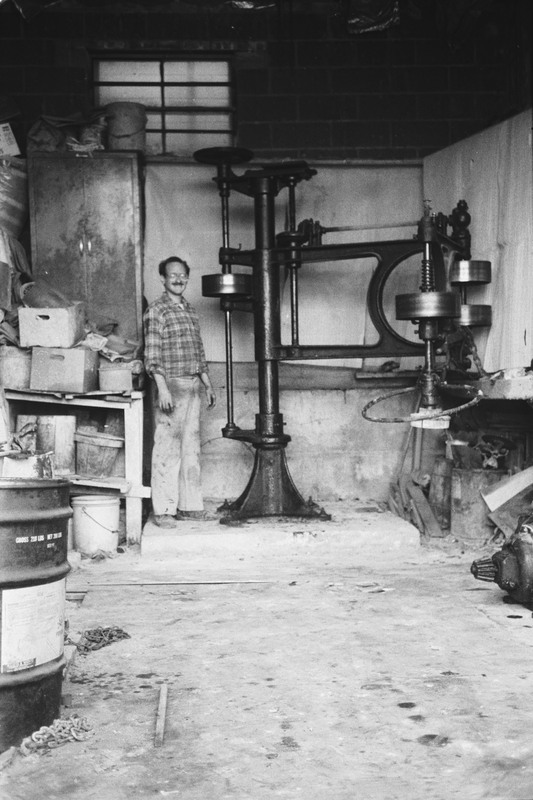 Presiding over Stanley’s smallish workshop was the commanding presence of his radial arm polisher, a stone grinding machine. A huge cast iron affair, it stood about ten feet tall and its long leather belt-driven arm had a 16-foot sweep. It was made in 1912 by the Patch Company in Rutland, VT. 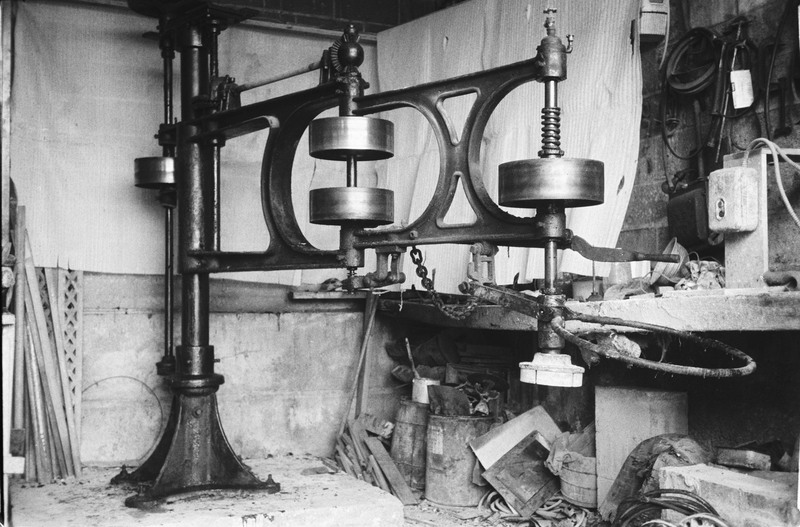 It had a monster 220-volt three-phase General Electric Motor made in Schenectady, NY that sat on top and turned a large cogwheel. The gear at the end of the motor’s spindle that drove the transmission was made of alternating stars of leather and bronze. This provided some give when starting up cold. I had never seen that before or since. The machine was telescoped onto, and rotated around a large stanchion that ended in a huge base flange that was bolted into what Stanley told me was a giant cube of reinforced concrete. At the end of the polisher’s long arm was a fitting that accepted the various grit twist-on grinding heads. These had a center hole to allow water to come down through the machine itself and centrifugally wash away the dust produced, creating slurry. The business end of the grinding head was a steel plate that had fittings to accept the five silicon carbide grit segments that formed a star pattern. The steel plate, or “iron,” is heated cherry red, then flake shellac is dropped onto this. Next the segments are placed into the fittings and are thus attached. Connected to the end of the machine is the large circular steel operator’s ring to control the grind. There were lots of fittings for greasing the machine, which was fairly caked with grease, both old and new. I brought a terrazzo piece to Stan’s. He put it on his inclined grinding bed, leveled the piece, then showed me how to operate the beast. He put a hill of quartz beach sand on the terrazzo, then put the machine over this with a 24-grit head. He opened the water valve on top, adjusted the flow then switched the machine on. The sand was very effective at scratching up the terrazzo. I appreciated how grinding with beach sand was an ancient technique from a couple of millennia back. Stan showed me how to throw the next hill of sand under the grinding head without turning the machine off. I mastered this but don’t recommend it, as it is too dramatic. I think he did this because it was a chore just to start and stop the polisher. The on/off switch was in a box near the wall, so you had to start and stop grinding near there. It was a little tricky to control the machine with one arm while you groped for the switch with the other. Later, there would times when I was fatigued and had to desperately try to hit the off button before an arm cramped. If this were my machine, I thought, I’d rewire the switch close to the operator’s ring on the machine. So you rough grind with sand in this manner until you can see that you have ground halfway through the thickness of the aggregates in your casting, and they are well exposed. You then thoroughly wash the terrazzo and the grinding head to remove absolutely all grits, then continue grinding with the silicon carbide 24-grit head with no sand. You change heads and go up through grits to 600-grit, always squeegeeing off the water to assess the terrazzo dry to see if you have removed all scratches from the previous grade of grit. Lastly, you put on the mop and polish with polishing powder. I could see that as much work as it was to grind with this powerful machine, it was easier than the way I was then grinding, which was to use terrazzo floor equipment. And before that, starting in 1979, I ground with a handheld grindstone, a sponge and bucket of water and elbow grease, if you can believe that. So it went on like this for a couple of years. I was able to cast designs that were larger in size, grind them at Stanley’s, and pay his landlord, who operated an adjacent pipe-lining business.